ABOARD THE VIKING SKY – I should have known better. The sign said very clearly “Cold bucket shower.” But I pulled the chain. And it definitely was cold. Very cold. But not nearly as cold as the Snow Grotto. On a ship, for goodness sake. The first one I’ve ever seen. 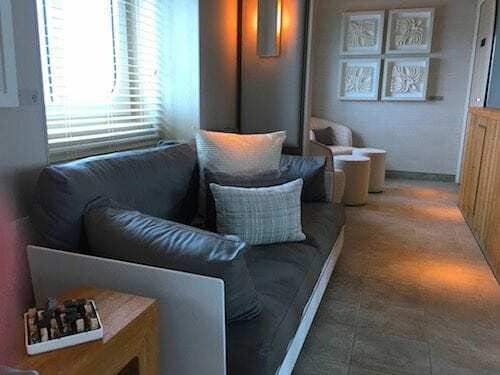 It is definitely an unusual spot on the Viking Sky. A subdued décor adds to the ambiance of the spa relaxation room. I’ll tell you more about those later. But first, I want to describe the wonderful spa, salon and fitness center aboard the Viking Sky. The ship’s fitness center is free to use and is the largest in the Viking fleet. It offers a good variety of cardiovascular fitness machines, such as treadmills, ellipticals, stationary bikes and TechnoGym weight machines. Other equipment is available, too, including weights, fitness balls, yoga mats, Pilates accessories and BOSU balls. A small studio is where classes take place such as yoga and stretching which have an extra fee. 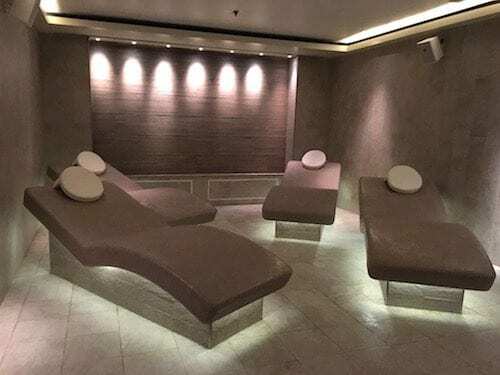 The Viking Sky’s spa has the same relaxing décor – muted colors, birch twigs and a long entrance wall filled with birch tree design – as the rest of the ship and can be used by passengers without charge. 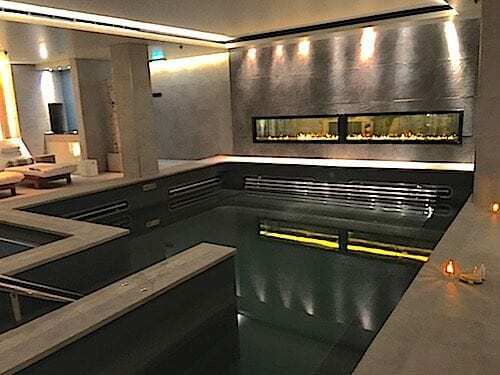 It features a thermal deep thalassotherapy pool, jetted hot tub, sauna, steam room, showers, padded loungers, heated ceramic loungers and plenty of towels and drinking water. The separate men’s and women’s changing rooms include lockers which are locked by a cabin key card. Huge robes and slippers are in the lockers for passengers to use. A small box in the locker is handy for putting valuables such as cellphones. A swimsuit dryer spins out excess water after spa use. A fireplace using water vapors and colored lights creates the illusion of fire in the spa. The separate changing rooms also have showers, bathrooms, a dry sauna and a cold tub. 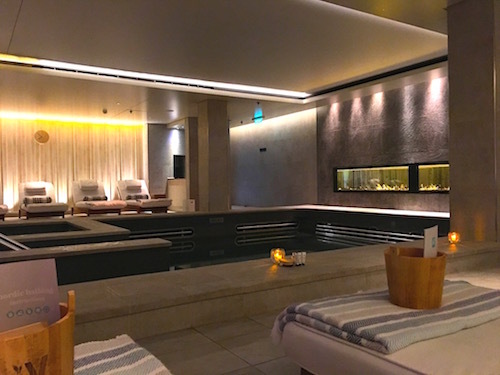 Run by the Sweden-based company LivNordic, the spa offers a variety of treatments such as massages, plus a salon for haircuts, color and styling and manicure/pedicures. But it is the spa and the Snow Grotto that caught my interest so I signed up for the optional Nordic Bathing Ritual ($39). The ritual was held one night after the spa had closed at 8 p.m. Participants were limited so there were only six in my session. Our group was led by spa attendants Linn and Marlin. We started by relaxing on lounges, draped in blankets with pillows under our heads and knees. Instructed to slowly breathe in and out, we were asked to mediate as a beginning exercise. Then Linn and Marlin described the process and the benefits of Nordic bathing. An unusual Snow Grotto is part of the Nordic Bathing Ritual. The process starts with warm and ends with warm, Linn said. So we head for the steam sauna where we were definitely warmed to the core. 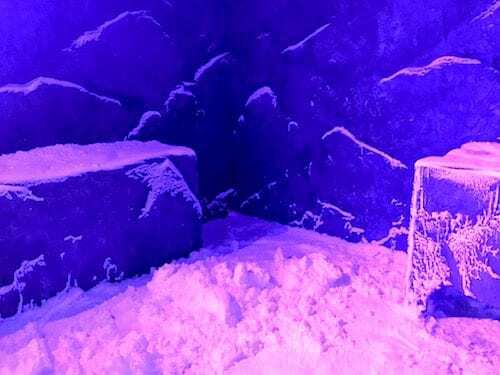 Then we went into that amazing Snow Grotto with snow covering the floor and heaped on the two benches. Best to take a towel to sit on the benches and wear slippers when entering the Snow Grotto. Then back into the steam sauna where Linn presented us with snowballs scented with eucalyptus. Running the snow on our bodies cooled us off a bit so we could enjoy the sauna a while longer. “In Norway, we roll in the snow after the sauna,” Linn said, before brushing us with a birch twig to stimulate circulation. Leaving the steam sauna is when I dumped the cold water bucket over my head. For those who would rather cool off with a friendlier method, a shower in the room has multiple jets and adjustable water temperature. As part of the ritual, we were each given a dry body brush and a bucket of Nordic bathing products to take with us when the session was done. First, we applied the Eco Facial Scrub, then added the Cloudberry Facial Mask, rubbing it into the scrub mixture. After washing off the mixture with a warm wet cloth, we applied Blueberry Queen Cream. Nordic bath products are ours to take after the session. We also had Sauna Birch Scrub Salt to rub over our bodies to help remove dry skin. And the dry skin brush to clear it away. The final part of our ritual was either a head, hand or foot massage by Linn and Marlin. I chose the foot but would have been happy with any of them. Glad I didn’t have anything else except bed on my agenda that night. It was certainly relaxing and sleep inducing. Now all I have to do is have a steam sauna and Snow Grotto installed in my home. The cold water bucket I can do without.